Heavy gauge wire, chrome plated constructed wall rack holds 16 rolls of 3 inch core diameter sign/wrap vinyls without using valuable floor space. 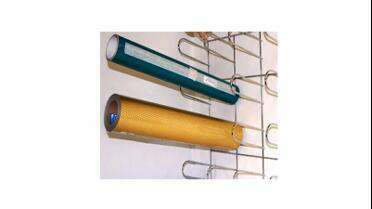 This rack is durable enough to hold even up to 16 rolls of 30 in. x 50 yd. material with ease. Proper storage of pressure sensitive materials dictates supporting rolls by the core to avoid adhesive activation. Included are 4 adjustable screw mounting clips, allowing alignment with studs in most walls (screws/bolts, wall anchors not included).